You know you’ve hit peak ‘adulthood’ when the opportunity to review cleaning chemicals and a carpet cleaner get you more excited than you thought it would. This is what happened to me when local company Rug Doctor got in touch, they’re based in Worthing but their snazzy machines ship all over the world! 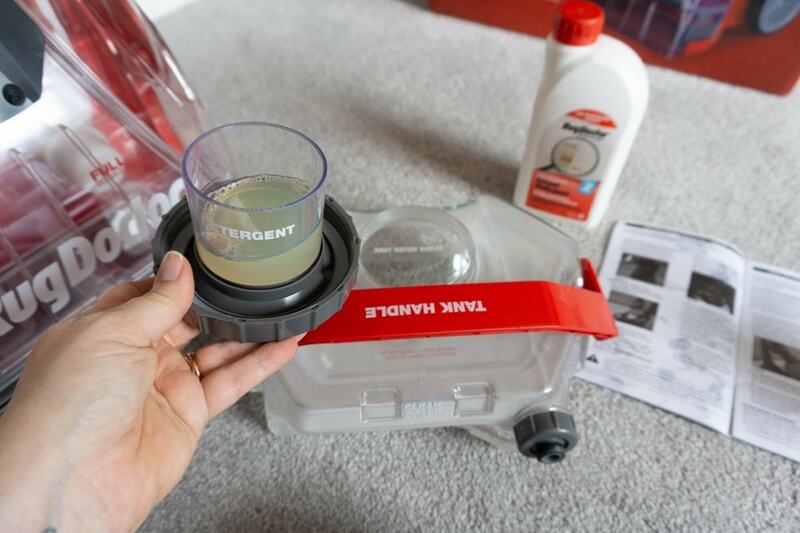 They wanted me to put their range of carpet cleaning chemicals to the test, so here’s what I thought of them! 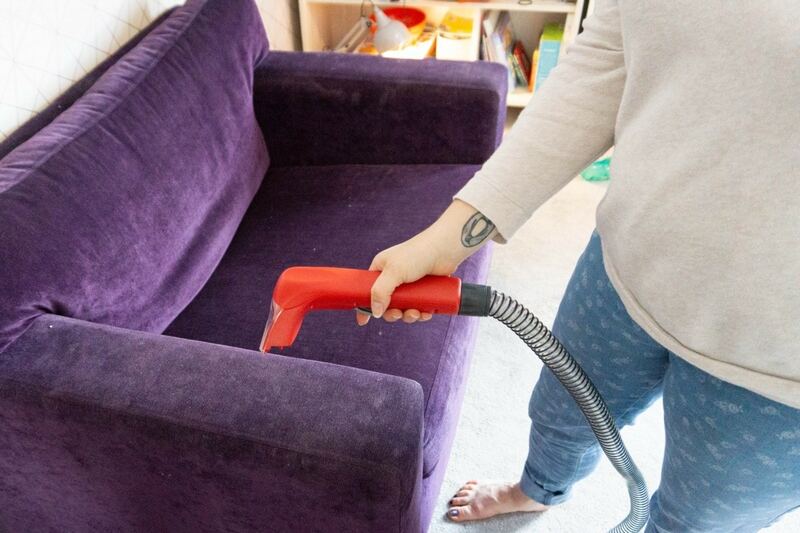 I was dubious about this, as I’ve tried other carpet specific stain removers and not been impressed, and have had a sore arm from so much scrubbing. I purposely chose an old stain to try it out on (plus lets face it, I wasn’t about to make a new stain to try, although now I probably would as it works so well!) and picked an old tea stain in our living room that had been hidden under a sofa since Christmas when my mum spilt it! You can see me using the Stain Remover in the video below but in brief: mop up the spill if it’s fresh, spray generously over the area, leave for 3 to 5 minutes and then use a cloth to start to push towards the centre of the stain. Even before we got to two minutes I could see the stain was lifting, and it had completely gone by the time I had finished scrubbing with the cloth! It says on the bottle stubborn stains may need two sessions but this wasn’t the case for tea at least! Really impressed with this compared to the other sprays and solutions I’ve used! Similar to the spray but in a handy pack of 20 wipes. They’re strong enough that you don’t stick a finger through them and they won’t disintegrate in use either. You’ll see in the video these got ballpoint pen ink out of the carpet easily, I sped up the scrubbing for fear of boring viewers but in under three minutes the blue pen parks had disappeared (tip – don’t leave pens in reach of ‘artistic’ three year olds!) I think if we ever stay in an rental home on holiday with the kids these will be in the suitcase, they’re so handy and transportable! Since I filmed the video I’ve used them to get chocolate out of a pale pink top Athena was wearing for the first time (another tip- make your kids wear bibs until they are at least ten!) They’re bio-degradable too, which I was pleased to see! Now luckily (for me, not so much for Rug Doctor, sorry!) I’ve not been able to test this yet. I do know that toddlers especially are not fussy about where they vomit when they have a bug, so I’m sure before long we’ll be testing it out on something! It works in a similar way to the Oxy Power spray but contains ingredients to combat the uric acid in and non-soluble salt crystals that it contains, getting rid of the smell and the stain. You can use in carpets of course, but also on mattresses – which will definitely come in handy in the even of an accident overnight! You can also use it in the Rug Doctor machine as well as with the spray, and I wish this had been around when I managed a pub that people used to vomit in every so often! 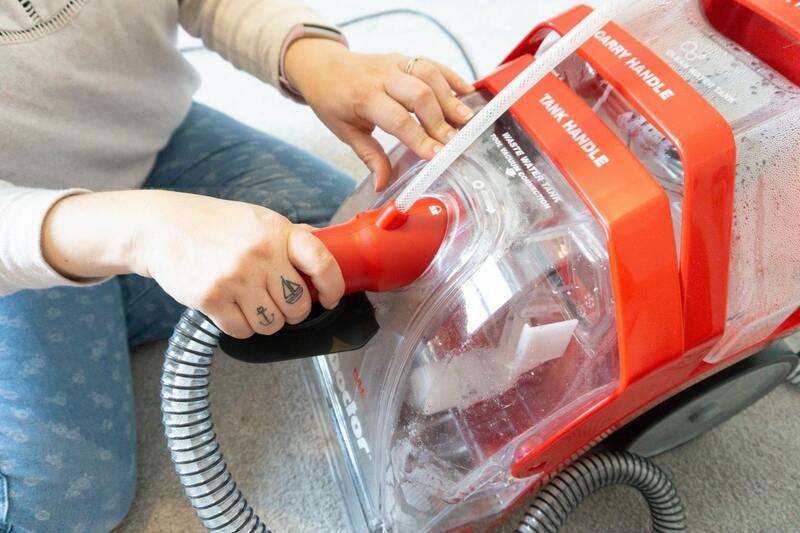 Rug Doctor have developed their Carpet Detergent to be used with their machines, and it not only cleans and deodorises but it contains ‘StainBlok’ which helps to prevent stains and spills in the future on the area you use it on. 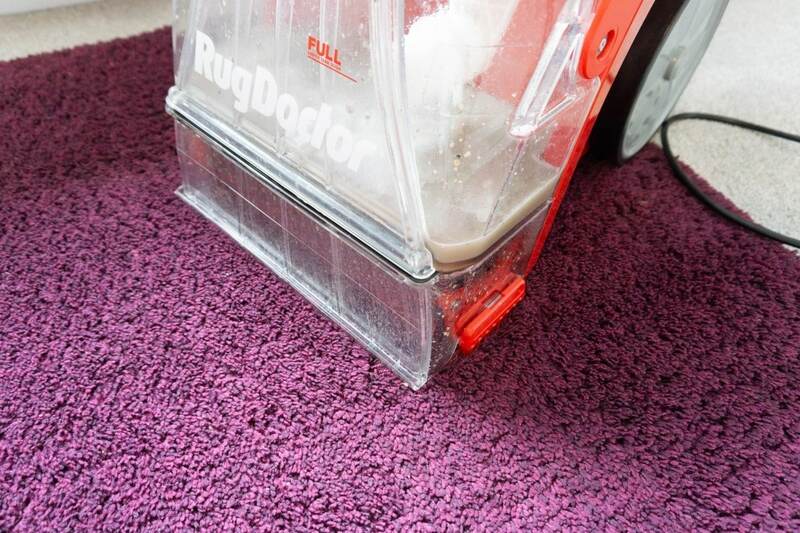 I used this to do the rug in the living room which you can see on the video, and since then have used it on an armchair and the rest of the carpets in the house and it is impressive, and also fairly gross when you see the colour of the waste water in the tank! Considering our carpets were only laid about 18 months ago I was surprised! You get a nice fresh scent in the room when you use it and a litre bottle will do two average sized rooms, although I managed to do the living room, play room, a rug and the hallway with one bottle. 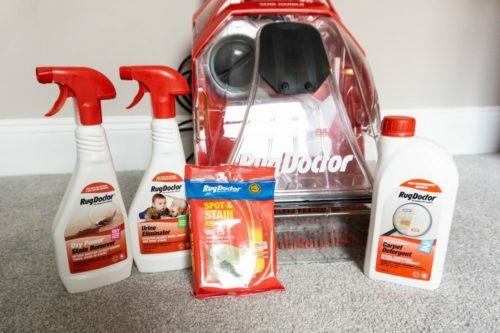 Using the Rug Doctor machine is much easier than I expected, I have rented a carpet cleaner (which may have been a Rug Doctor, it was many years ago as I moved out of a flat and had to panic clean the carpets!) and found it tricky and unwieldy to use and remember being frustrated by the whole experience. 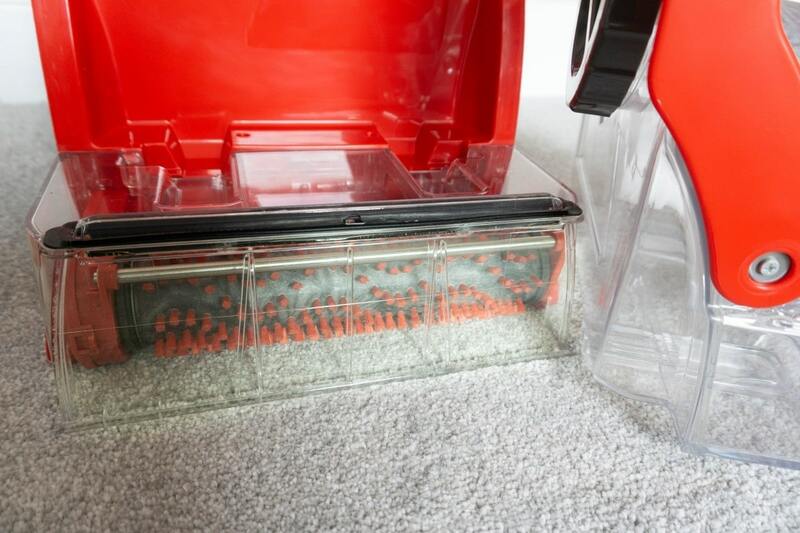 With the Deep Carpet Cleaner everything is marked clearly and it’s easy to fill with solution with the handy measuring cap and just as easy to empty, no leaks or spills. Using the upholstery took was a doddle and I’ll be using this on mattresses, car seats, dining seat chair pads and anything else I can think of! It was easy to manoeuvre with the large wheels, and I loved that the handle folds over for more compact storage. It weighs just a little more than a large upright Dyson, for comparison. I’m now planning to do a carpet clean every three months as minimum, and my mum has been eyeing it up too so perhaps I’ll do her carpets as a birthday present! I jest… but I think she’d appreciate it! Please do take a look at my video where you can see the cleaning chemicals, and the machine in action!